Larry Colley at his son Justin's graduation for Basic Training. Boost a Hero, an online crowdfunding platform powered by Sprigster, uses grassroots social media efforts to find potential donors in the military community and beyond. Larry Colley, a 21-year Army veteran and Bronze-Star recipient, has been selected by The Dwyer Group in Waco to pilot Boost a Hero as he raises funds to open an Aire Serv® franchise in Tampa, Fla. Colley spent 6 years with the 82nd Airborne Division and 15 years with the Army Special Forces and served in the Gulf War and Somalia. His wife is also a veteran and his son is currently serving with the Army in Afghanistan. Colley shared the lifelong dream of business ownership with his father who recently passed away, and plans to involve his son in the business after his return from deployment. Military.com recently conducted a Q/A session with Sgt. Colley as well as Mary Kennedy Thompson, Chairwoman of the IFA's VetFran Committee and President of Mr. Rooter. For more details on Boost a Hero program, and to make a donation, visit boostahero.com. Military.com: Sgt. Colley, can you give us a brief recap of your Army career, and how the military has shaped your life? Larry Colley: I joined the U.S. Army at 17 years old, spending six years with 82nd Infantry Division and then 15 years with the Army Special Forces (Special Forces Medic and Team Sergeant). The Army taught me how to succeed. After 10 years of retirement from the Army, I am in the same position as my civilian co-workers who have been in the career their entire life. I contribute all my success to the Army way of life -- I did not stop living what I learned over my 21-year career, which is hard work and dedication to duty. Military.com: Captain Thompson, we understand you are a veteran as well. Can you talk a bit about your military background, and what led you to become involved with franchising? Mary Kennedy Thompson: I served eight years in the Marine Corps. Serving as a logistics officer, I achieved the rank of captain while on active duty and major in the reserves. During my time in the Marine Corps, I was stationed around the world, including Camp Lejeune, N.C., Treasure Island, Calif., and Okinawa, Japan. I began my career in franchising as a franchisee. After serving eight years in the Marine Corps, I returned to civilian life and realized franchising was for me. It provided a model that would help me thrive as a small business owner. I became accustomed to following systems in the military, and it's helped me succeed in franchising – where systems are the foundation. Military.com: For those who might not be familiar with VetFran and IFA, can you give an overview of these organizations? Mary Kennedy Thompson: The Veterans Transition Franchise Initiative (VetFran) program gives incentives and discounts towards the purchase of a franchise to honorably discharged U.S. veterans. The late Don Dwyer Sr., founder of The Dwyer Group®, started this program after the Gulf War. The Dwyer Group reintroduced the program after 9/11. Since 1991, the VetFran has helped more than 2,100 honorably discharged U.S. veterans purchase their own franchises. There are more than 400 franchising companies participating in the VetFran Program. Military.com: Sgt. Colley, how did you decide on small business ownership as your current career? Larry Colley: I have always wanted to own my own business; it has always been my dream. After being a leader in the Army for so many years, it is hard not to be in charge and mentor others. Military.com: How would you describe the current climate for veterans who are looking to become business owners? What are the opportunities and challenges? Mary Kennedy Thompson: Executives in the franchising industry know how the military demands hard work, perseverance, and dedication. It takes these same characteristics to open a franchise, as well as make it successful. Veterans are often top performers within franchise networks. However, most veterans don't know about the programs franchising companies have in place to specifically recruit retiring military men and woman. From my experience in helping veterans start their own franchises, I have learned a number of things veterans don't know about franchising. When people think of franchising, they usually think of the golden arches of McDonald's. But there is actually a franchise for just about anything you can think of. These companies range from the obvious fast-food restaurants to home-services companies, like my company Mr. Rooter® Plumbing, to even businesses like dog grooming and hotels. Military.com: Sgt. Colley, why did you decide to join up with The Dwyer Group? Can you talk about how they have supported you, both as a small business owner and a veteran? Larry Colley: I was looking for a strong foundation to build a business on and The Dwyer Group seemed to offer that -- it has over 150 other Aire Serv franchises that I can turn to for advice. I saw no need to reinvent the wheel when they had tried-and-true systems already in place. They have helped support me through connecting me with Sprigster, which is a crowdfunding organization helping veterans offset the cost of owning a franchise through its Boost a Hero program. They contact me weekly to ensure the start-up process is going smoothly and to see what additional support I need. Military.com: As someone new to owning a business, what are some of the skills you learned in the military that have helped you so far? Are there new skills you've had to pick up? Larry Colley: Management, organization, and leadership are skills that the Army taught me and that have helped me succeed in civilian life. I have had to learn how to slow down; things do not happen as fast or effectively as they do in the military. Military.com: Can you talk about how the Boost a Hero program came about, and your participation in it? Mary Kennedy Thompson: Sprigster was founded by serial entrepreneurs, Mark Mohler and Todd Jones, who have both spent the past 15 years focused on small business formation, with an emphasis on social entrepreneurship-based businesses. Sprigster approached The Dwyer Group at the start of the year about participating in their brand new program. We screened several veterans that were in our sales process, and selected Larry Colley as the best fit for the program. Military.com: How are Boost a Hero candidates selected? Mary Kennedy Thompson: Boost a Hero candidates must first be approved by their future franchisor before applying to Boost a Hero. Each franchisor has its own set of requirements, but most include a background check, credit check, certain capital requirements, and any industry-specific licensing. For Boost a Hero, candidates must be at least 18 years of age and be former members of the U.S. military who ended have ended their service and were honorably discharged after September 11, 2001. Each candidate must agree to pay down at least 20% of the amount they aim to raise to their franchisor. Candidates must also be permanent U.S. residents with a Social Security Number, U.S. address, bank account, state-issued I.D., and credit or debit card. Military.com: Can you talk about your experiences in the Boost a Hero program? Larry Colley: I was asked to help start the Boost A Hero campaign to initiate the crowd-funding for veterans program. This has been an honor, and I hope many veterans benefit from this idea. It has been a great experience and the challenge is in getting the word out to the right people who would be interested in the campaign. Military.com: Coming out of the military after a long time in service, can you talk about some of the challenges you faced in building your civilian career? Larry Colley: Going from military life to civilian life was tough. It was stressful on me and my family. There were a lot of mistakes made and there was a learning curve. You come out of the military after being in charge and start in civilian life at entry level. You get breaks here and there and take advantage of them when you can. You work hard, be loyal and dedicated, don't lose your military roots, and in the end you will be successful. Military.com: What advice or tips would you have for veterans who are now transitioning out and looking to start a career? Larry Colley: Hopefully you have prepared yourself by taking advantage of military educational programs and training. Never forget what you learned in the military as far as management and leadership skills. Even though you may start out at the bottom, you will move up fast—have patience. Don't expect to be paid your worth at first but it will catch up fast as your employer sees the benefits of having you and your experience. Mary Kennedy Thompson: Starting your own business can be daunting, and a franchise can help you minimize your risks. A franchise is essentially a Standard Operating Procedure (SOP) on how to operate a business. If you want to start your own business, I suggest you research the VetFran program at www.vetfran.com. A list of participating companies is available on this website. Veterans can receive these benefits when purchasing a VetFran franchise: a percentage off the franchise purchase, preferred financing with lenders, training and support, discounts on start-up materials, and vendor discount programs specifically designed for veterans. There are also military recruiting companies that can help. I recommend visiting www.recruitmilitary.com and www.franchise.org. Here you can see a schedule of franchising shows that could be in your area, as well as learn about franchising in general. I suggest you find a business that revolves around your passion or something you like doing. You also need to invest in a franchise that you are genuinely interested in. You will be making a sizable investment, so I encourage you to do as much due diligence as possible. Many franchising companies offer assistance in funds, and some even offer in-house financing for veterans. But if you are concerned about finance matters I recommend visiting www.sba.gov. 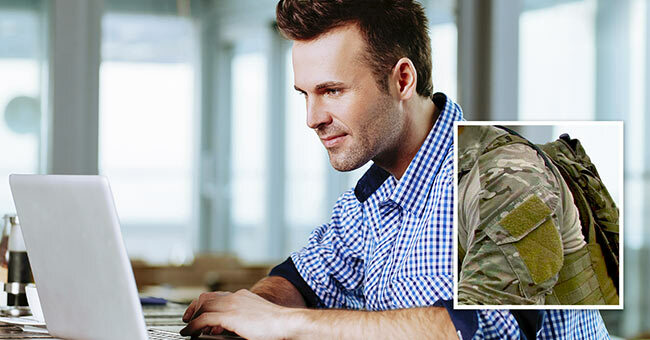 Veterans actually have an advantage in applying for credit, because SBA programs like the Patriot Express Loan are becoming increasingly popular and somewhat easier to get than the traditional loans. There are lending programs through the SBA and grants through various government agencies. The process of buying a franchise could take anywhere from a few weeks to a few months. Be prepared to spend quite a bit of time talking on the phone with both the franchisor and some of their franchisees. When it comes to investigating a franchise, I recommend you request a Franchise Disclosure Document (FDD), which the FTC requires companies to provide. This document contains earnings claims, litigation against the franchisor, expected funds needed, and how the franchising company works. It's also important to ask the franchisor as many questions as possible. I would also talk to a couple of franchisees to find out what they like and dislike the most about the franchise. Don't worry about asking these questions, because most franchisees are more than happy to share their feelings about the business. Most franchising companies have a discovery day of sorts that will give you a glimpse into what they provide for their franchisees. This is another great time to have questions answered and an opportunity to meet face-to-face with the leaders of the franchising company.